One hallmark of outstanding customer service is the speed at which a business responds. If you have thought of SoGoSurvey purely as a data-gathering tool for trend analysis, it may not have occurred to you to use the software as a tool to improve the relationship with your customers. Most of the time, customers view SoGoSurvey as a way to gather information for later, thoughtful analysis. And we certainly are great at that! But with SoGoSurvey’s “rules and alerts” feature, you don’t have to wait for “later” to take decisive action. You can respond to a situation immediately based on a survey participant’s individual responses. That’s immensely useful. It’s always been important to contact disgruntled customers and to address their concerns, but in recent years, speed-of-response has become even more important. It’s no longer an issue of darkly muttered complaints to a few people; nowadays, upset customers may complain on social media. Sometimes those complaints go viral. Worse: Even though the number of social media complaints are on the rise, Twitter, Facebook, and other social media are far from the best way for an organization to respond. Or at least businesses don’t actually do so, according to Maritz and Evolve. Their research discovered that only 29% of 1,298 Twitter complainants had the company reply to their gripes. And yet we all know that a company that reaches out as soon as it learns about a problem can turn around the entire customer experience. You already know that it makes sense to do customer surveys to judge how well you’re satisfying customers. One advantage to using SoGoSurvey is that it makes it easy to send an email alert so you can respond in a flash. You set a rule based on the answer to a question or to a set of questions, or to an event that occurs in the survey. 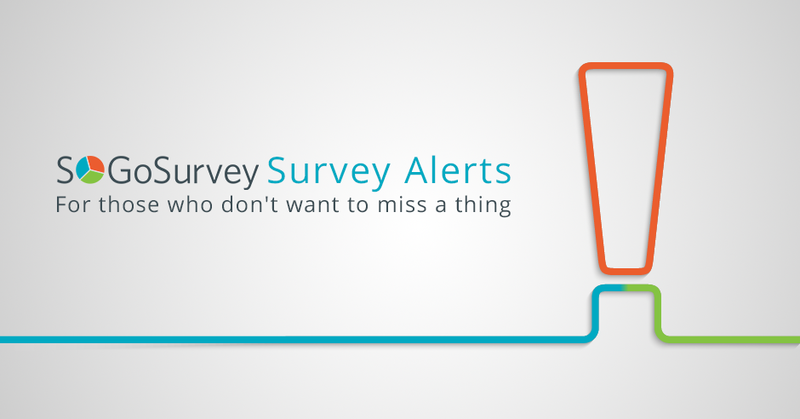 You establish an email alert for SoGoSurvey to send when that criteria is met. To use Rules and Alerts, first finish your own overall survey design process. Then, from the Survey Design page, select the survey, and choose Rules and Alerts (it’s a choice at the top right on your screen). Name the rule and give it a description. When a survey is completed. This is useful for ongoing customer service data collection, especially for Web forms such as product return authorization requests. These arrive infrequently enough (we hope!) that it would not occur to you to log in daily to check for responses. Any such request should be sent to someone’s attention for immediate action. When a data threshold is met. Less useful for customer service use cases, sometimes you want to know when 500 scholarship applications have arrived. When a survey response meets a condition. Here’s where you can catch urgent situations as soon as possible. Select the question to use as the alert criteria, and the answer or answers that should set things off. Typically these would be indications of dissatisfaction, such as a poor product or company ranking, or a feedback item suggesting that something had gone awry with the customer’s experience. For customer service needs, most often the right recipient is an email list or a single ID. The real-life challenge in many organizations is to ensure that someone actually receives that message. Too often, after “Joe” leaves the company, alerts are sent to a black hole – exactly the response you don’t want when you promise customers an immediate response! Be sure to arrange with your company’s email administrator to associate “customersupport@” with a department or individual. In any case, be sure to put a human process in place to support the workflow. You can – and should – customize the email text to reflect the specific rule that was invoked. For example, use text in the subject line with email filtering to send it to the correct department. A hotel’s customer satisfaction survey that yields a poor rating for its restaurant can be forwarded automatically to the catering department. You can schedule alerts to match your needs, such as once a week, though for the customer service scenario we’ve drawn here you probably want alerts sent immediately. The email alert can include a report. While that data can be just about any report – it’s obviously up to you – most commonly the report is the full response from the survey, so whoever handles the issue has all the information to hand. If you include the full text of the response (especially the answer to an open-ended question such as “Why did you rank the product as disappointing?”) and the customer’s contact information, a company representative can pick up the telephone to call right away. It also helps the customer service representative forward a complete picture of the situation to the right people to fix the situation (both individually and systemically). For instance, if a hotel guest’s poor ranking is because the towels weren’t restocked, that information should be sent to the Housekeeping department along with queries from the customer service manager about what went wrong. Naturally, rules and alerts can be used for plenty of other things. For example, you can send an alert to the Sales team when a site visitor fills in a Web form to register for a webinar; or a staff member responsible for the market research can be alerted when a survey reaches an important threshold (such as 200 female respondents); or a new patient registration may trip an email alert that synchronizes with an external scheduling application (using our API or some other customization). But I chose to write about SoGoSurvey’s rule and alerts’ benefits in customer service for two reasons. First, customer service is among the most popular reasons for organizations to conduct surveys. Also, we all have our own frustrations with companies that didn’t respond to our complaints; don’t you wish some of those organizations had used a feature like this to help you out when you had a problem?